Sports Performance is all about developing a complete athlete. What all goes in to developing a complete athlete you ask? 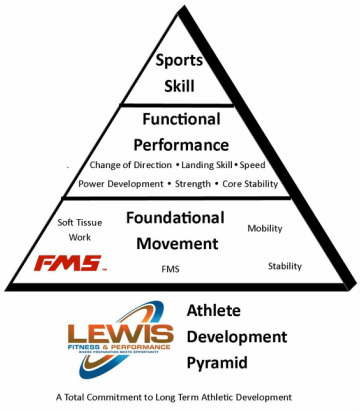 At Lewis Fitness & Performance we use an Athlete Development Pyramid to illustrate the necessary components needed in this process. The essence of this pyramid is that it needs a great foundation to grow to its full potential. At the base of the pyramid is Foundational Movement. These qualities are assessed and developed on a daily basis as part of all of our programs here at Lewis Fitness & Performance. These qualities are addressed primarily during our pre-workout and dynamic warm up sections of our program. The next level of the development pyramid is the Functional Performance level. In this section we look to develop and improve the underlying qualities that would define what it means to be a great athlete (speed, quickness, agility, strength, power, conditioning). These qualities are what make up the remaining qualities of our program. The top level is Sports Skill. These qualities are the ones that are developed during sports practices, camps, technique work, etc. These skills are left up to the coaches that work with the athletes in the sports in which they play. The development of these skills is not a part of the program at Lewis Fitness & Performance. However the take home point from looking at this pyramid is that complete development as an athlete is not built on the greatest quality and quantity of coaching of sports skills. That is important, but the without the foundational movement and functional performance qualities the development of skill will have a shorter ceiling. YOU CAN'T BUILD A PYRAMID UPSIDE DOWN! The workout consists of functionally sound movement training, strength training and conditioning with a strong focus on basic and proper technique. The workout becomes progressively more challenging once basic techniques have been mastered. The groups are kept small, no more than 9 per group, to allow maximum individual attention.